This past December, Edurne Pasabán came to visit IE Business School and shared her experience with our International MBA students. 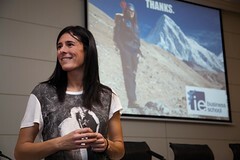 Edurne Pasabán is a successful and well-known mountaineer and the first woman who climbed all fourteen eight-thousenders. We are very happy that our students got the opportunity to get in touch with such a successful leader who knows what it means to work with a team in the most difficult times as well as the importance of good communication and clear objectives. We are looking forward to welcoming Edurne back soon at IE! Please click here to view our photo album of Edurne’s visit. Real life consulting experience during the International MBAWhat are companies looking for?